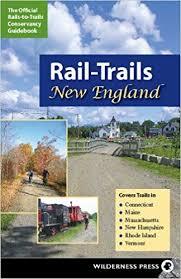 This weekend tour of the popular Berkshires in western Massachusetts takes you into neighboring Connecticut and New York State. All routes begin from the Windflower Inn near the Great Barrington / South Egremont town line. 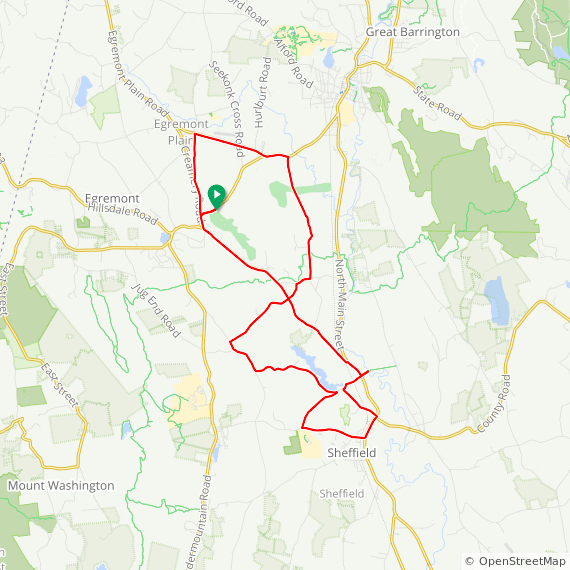 Daily Ride options are 30-45 miles, with a nice mixture of a few flat roads, rolling hills and some long steady climbs, designed for upper intermediate to advanced cyclists. We recommend dinner at the Old Mill Restaurant in nearby South Egremont. While in the area, see what’s happening at the Mahaiwe Theater Performing Arts Center in downtown Great Barrington. This ride begins at the Windflower Inn. 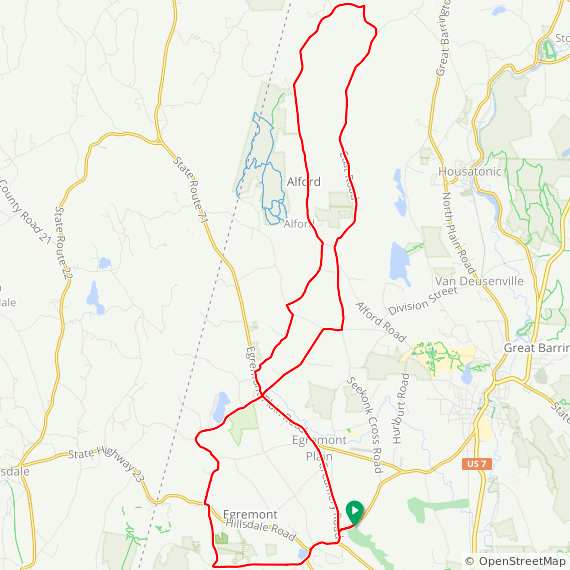 We head west to the foot of the Taconic mountains and then take back roads to North Egremont. From there, Rt. 71 to the New York state line is a straight and scenic a roadway with views of the mountains the entire way. We circle north through Alford before looping back through Alford to the inn. 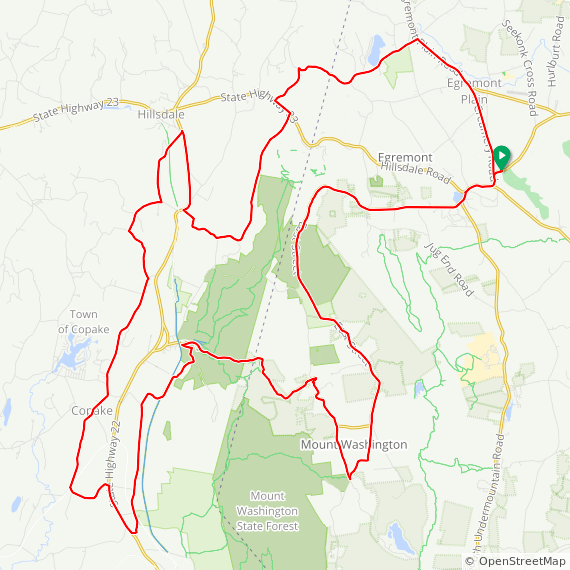 Distance: 34 mi, Total elevation: + 1240 ft. 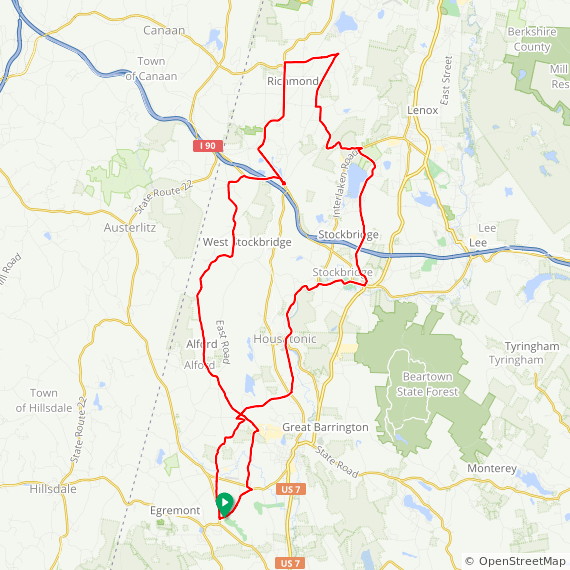 This classic Berkshire ride starts out with some easy cycling along the flat flood plain of the Housatonic River through Sheffield farmland to Mill River, with an optional gravel side route to Umpachenee Falls. 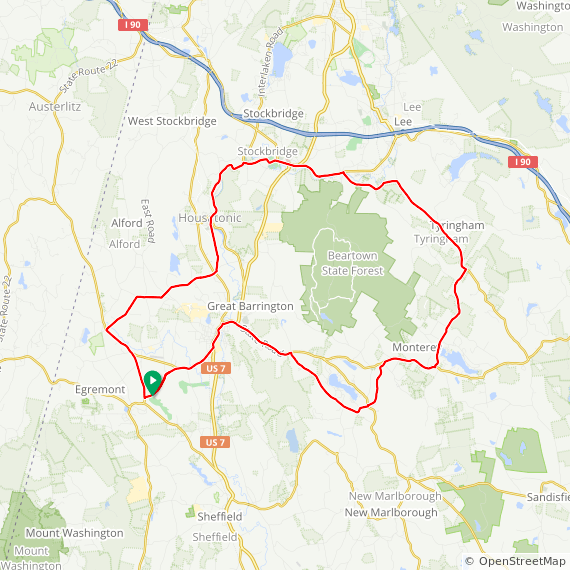 The return includes an exhilarating downhill ride back to the Housatonic River before returning to Sheffield, where you may want to stop by the oldest covered bridge in Massachusetts. Ride north along the edge of the Taconic Mountains and through tiny Alford to West Stockbridge, where you can visit Baldwin’s General Store and Hoffman Pottery. The ride continues on to Stockbridge, MA, home of Norman Rockwell Museum. and Chester wood, the studio of Lincoln Monument sculptor Daniel Chester French. 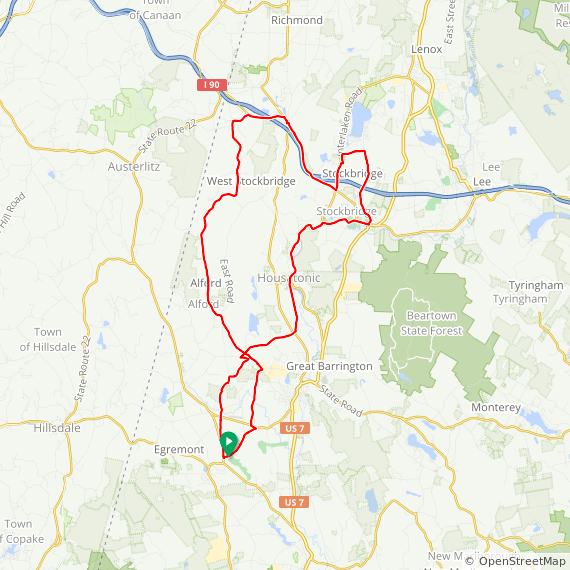 The return is along the rapids of the Housatonic River to Great Barrington and back to the inn. 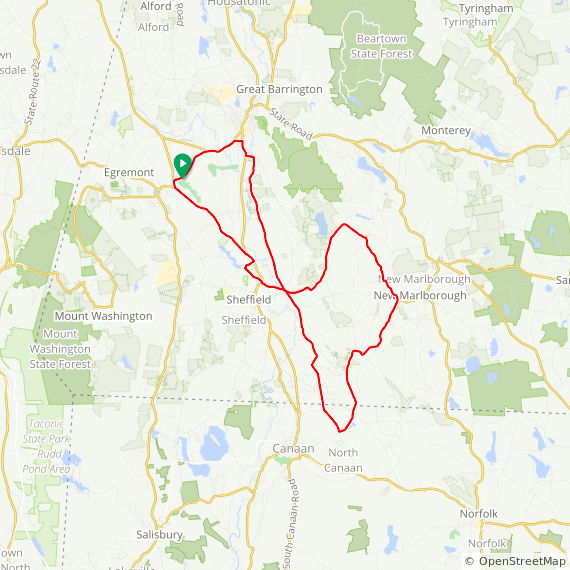 This scenic 40 mile ride goes through downtown Great Barrington Massachusetts and heads out of town up “Three Mile Hill. We circle around Lake Buel, then top to check out the Berkshire Fish Hatchery in Hartsville. Continue on to Monterey, MA, and stop for refreshments at the Monterey General Store. 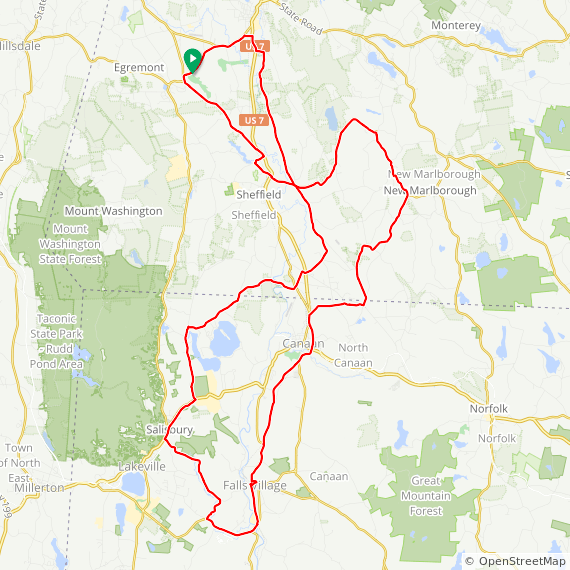 The ride continues past Lake Garfield with a sweeping descent into the Tyringham Valley. Make sure to stop to view the Gingerbread House in Tyringham just before taking a left to South Lee. After turning left on Rt. 102, you’ll see an impressive dam and spillway on the left, part of a still-operating paper mill. Continue on to popular Stockbridge, whose attractions include the Red Lion Inn, Berkshire Botanical Garden, the Norman Rockwell Museum, and Chesterwood, home of Lincoln Monument sculptor Daniel Chester French. 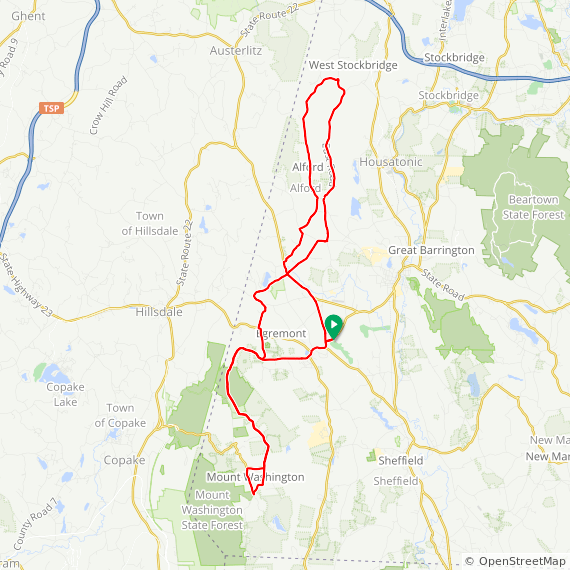 The return from Stockbridge follows the flowing rapids of the Housatonic River back to Great Barrington. 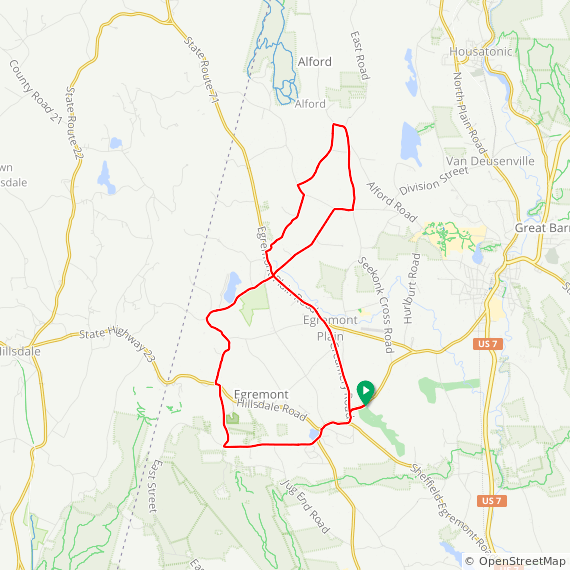 We head west to the foot of the Taconic mountains, then reverse course, with two distance options in North Egremont and Alford.